Happy New Year, food consumers! The Food and Drug Administration begins on Jan 1, 2006, to require food manufacturers to list trans fat on their "Nutrition Facts" panels. Many manufacturers have already begun to report the amount of trans fat, which increases the risk of heart disease much as saturated fats do. Trans fats are found in baked goods, french fries, and hydrogenated vegetable oils. To a smaller extent, these fats also occur naturally in meat and dairy products. Leading scientific panels have encouraged consumers to select products with as little trans fat as possible. The Food and Drug Administration has bent over backwards to act deliberately -- even slowly -- and to make sure that this decision is economically sound. The law that authorized the agency to add new lines to the nutrition Facts panel dates to 1990, and a citizen petition demanding the listing of trans fat dates to the early 1990s. A draft rule was published in 1999, and the final rule in July 2003 gave manufacture another 2-3 years to comply. The agency recently offered to let many companies delay implementation for a reasonable period after January 1, just to make sure they can use up their existing stocks of food labels and avoid needless duplicate printing costs. The agency's analysis of costs and benefits, published in the Federal Register, is exhaustive. In such studies, seemingly minor changes in the assumptions can sometimes lead to major changes in conclusions, but this rule was not a close call. The agency estimates that even a small reduction in consumption of trans fats would prevent 600 to 1200 heart attacks per year, and save 200 to 480 lives per year. The economic savings over several years (discounted to present value) would be $900 million to $1.8 billion each year. By contrast, even when you sum all the testing, labeling, and product reformulation costs, the total is about $140 million to $250 million one time only. The policy is very respectful of first amendment issues and consumer sovereignty. Rather than banning trans fat, FDA merely requires that consumers be provided with the information they need to make their own best choice. Judging by the response of leading food manufacturers, such as Kraft, the food giants suspect that consumers very much want to protect their health and avoid trans fat. 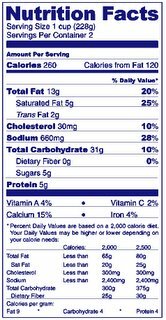 In the new label, there is no daily value for trans fat, because there is no recommended level -- better to avoid these fats whenever feasible. FDA considered requiring a footnote saying that health experts recommend "as little as possible," but the agency responded mercifully to industry complaints about this language. The best way to use the label is to add the value for trans fats to the value for saturated fats in your head, and compare that sum to the daily value. The most important shortcoming of the current rule is that it doesn't apply to restaurant chains -- who use gobs of trans fat in their fried foods. On an exam question this month, I asked students to describe ways that the new food guidance illustration, MyPyramid, graphically encourages physical activity (easy -- the graphic has a person walking up steps along the side of the Pyramid). I also asked students to describe ways that the illustration encourages moderation in food intake (this is more difficult -- one might talk about how the widths of the colored triangles favor foods with lower caloric density). Your query is too restrictive. A quick Google search shows that this motto actually is sometimes used by the healthy living program, America on the Move. In addition to writing here, I am guest blogging for about three weeks at Calorie Counter News. Mark has also invited a couple fine writers to contribute while he is away: PastaQueen of Half of Me and Tanya Taylor of I Ate a Pie. Make a visit. He has filled the hungry with good things! And Mary said, "My soul magnifies the Lord, and my spirit rejoices in God my savior.... He has shown strength with his arm, he has scattered the proud in the imagination of their hearts, he has put down the mighty from their thrones, and exalted those of low degree; he has filled the hungry with good things, and the rich he has sent empty away." How long has this crazy mumbo-jumbo been around? It certainly didn't start with Mary. She was inspired by the Israelite heroine Hannah. Hannah also prayed and said, "My heart exults in the LORD; my strength is exalted in the LORD.... Those who were full have hired themselves out for bread, but those who were hungry have ceased to hunger.... The LORD makes poor and makes rich; he brings low, he also exalts. He raises up the poor from the dust; he lifts the needy from the ash heap, to make them sit with princes and inherit a seat of honor." Happy holy days to you and your family. The Becker-Posner Blog, a leading economics weblog by University of Chicago Nobelists Gary Becker and Richard Posner, tackles the obesity epidemic this week. The authors had just read the new Institute of Medicine report criticizing junk food advertising for children. As one might expect from these writers, they point out that much of the economic burden of obesity is carried by the overweight persons themselves, so the writers suggest there is little grounds for a government response. I encourage Becker and Posner to reconsider their view with an open mind. They point out that there is only a comparatively weak "externality" argument for government interest in this problem (although one could talk about how many Americans share the same risk pools, due to medical insurance). However, the market failure that motivates a sensible government response to the obesity epidemic is an information failure. Just for starters, see here for a discussion of nutrition disclosure in restaurants, and here for a discussion of government communication about diet, health, and obesity. Because the federal government actively promotes advertising campaigns to get people to eat more beef, pork, and cheese, at a cost of several hundred million dollars each year, it would be far too timid to suggest that a laissez-faire response will suffice. Policy reform is required. If children nowadays are heavier because they are less physically active than they used to be, or because their parents find fast food cheap and convenient, it is difficult to see how advertising by food and beverage companies are to blame. And despite the hype the study received, the Institute of Medicine's report on obesity and advertising did not present any convincing evidence that television advertising oriented toward children has been responsible for the increase in children's obesity during the past quarter century. Not only would banning television advertising of fattening foods on programs oriented to children and teenagers not reduce obesity, but it might increase it. To the extent that, as Becker suggests, such advertising has a much greater effect on brand shares than on aggregate demand for the products, the advertisers as a whole might be better off if forbidden to advertise. With higher profits, and an important form of nonprice competition eliminated, advertisers might compete more on price, resulting in lower prices to consumers and therefore greater competition. One reasons seldom mentioned as a general factor partly behind the rise in obesity is the expectation that new drugs will greatly reduce the adverse consequences of being obese. I am not claiming that many teenagers are conscious of this consideration. However, any one who has observed the development of blood pressure and cholesterol lowering drugs during the past few decades can rationally believe that in twenty years or so still newer drugs that control diabetes and other diseases will be developed. Then for anyone who likes to eat sugary and fat foods, it does not seem so irrational to do so when the consequences will be much less harmful to health than they are at present. Seems far-fetched, but clearly reflects the imagination of a true blue economist. With tear gas in the streets and little substantial progress in the halls where trade talks are held, the WTO negotiations in Hong Kong look like a failure (see the report by Keith Bradsher in tomorrow's New York Times). Inside the hall, many ministers from developing countries voiced unhappiness that the European Union had not agreed to set a date for the elimination of export subsidies, despite an international agreement in July 2004 to phase them out. The draft text set two possible dates for eliminating farm export subsidies: either 2010, or five years after a global trade agreement begins. Such an agreement could be far away, given the pace of negotiations, trade specialists warned. Leaders of the European Union agreed on Friday to a budget that maintains farm subsidies through 2013 at more than double American levels. Export subsidies help rich countries sell food in poor countries, depressing income that some of the world's poorest people get when they sell in local markets the food they produce. "For them, an end date is absolutely essential," said Foreign Minister Celso Amorin of Brazil. European Union officials vowed not to accept a deadline of 2010 and complained that not enough had been done on services. This failure may well mean that farmers in developing countries face another decade of striving in vain against the blasting current of subsidized American and European grain, which washes their markets away like a flood. Weblogger (and soon-to-be Fletcher School faculty colleague at Tufts) Daniel Drezner provides a first-hand account of being in lockdown in Hong Kong, and also refers readers to this "link-rich post" from the weblog Simon's World for the latest news. In Cuban tradition, today's feast of San Lazaro also honors Babalu Aye, the being who protects against fearsome diseases. He is honored with African drumming and special offertory food. Anderson Allen has a charming report yesterday for Public Radio International's program The World (link here for the audio), about the song "Babalu." This song became famous in the United States through the television show "I Love Lucy," but it actually has a rich Cuban tradition. Anderson is a Washington, DC, area musician -- especially a Cuban drummer -- and an old friend from a group house on P Street in the early 1990s, where we cooked communally and hence shared many dozen a vegetarian meal together. Are religious conservatives complacent about poverty and hunger? According to Jim Wallis of Sojourners, in a Washington Post article today, conservative religious leaders "have agreed to support cutting food stamps for poor people if Republicans support them on judicial nominees.... They are trading the lives of poor people for their agenda. They're being, and this is the worst insult, unbiblical." High levels of dairy and calcium consumption are associated with increased risk of prostate cancer, according to research published this month in the Journal of the National Cancer Institute. The authors, Xiang Gao, Michael LaValley, and Katherine Tucker used data from the the best already existing prospective scientific analyses. The research was part of Xiang Gao's recently completed dissertation (I served on his Ph.D. committee and discussed one of the other papers from the dissertation here). The Dietary Guidelines for Americans 2005 recommends that Americans increase their intake of dairy products. However, some studies have reported that increasing dairy product intake is associated with an increased risk of prostate cancer. We conducted a meta-analysis to examine associations between intakes of calcium and dairy products and the risk of prostate cancer.... High intake of dairy products and calcium may be associated with an increased risk of prostate cancer, although the increase appears to be small. The authors place these results in the context of the most recent Dietary Guidelines for Americans, which recommended increased dairy intake. That new recommendation was controversial, in part because of the possible link between dairy and prostate cancer (see Newsweek, for example, which quoted Harvard's Walter Willett raising these concerns). This dairy and prostate cancer connection motivated an earlier satirical advertising campaign by animal rights groups, featuring former New York City mayor Rudy Giuliani without his permission, along with the slogan, "Got Prostate Cancer?." The federal government heavily promotes dairy through checkoff advertising programs, which make no effort to provide balance about the respective advantages and disadvantages of the advertised products. The new research by the Tufts researchers received extensive press coverage this month (see WebMD and ABC's affiliate). Josh Miner offers an eccentric but interesting opinion piece on Marketplace today about food stamps, commodity programs, and nutrition subsidies. After some rough introductory comments at the expense of food stamp recipients, his main policy proposal is to reduce field crop supports and replace them with a subsidy for healthy food. It's a democracy. Speak up! Perhaps you think this December would be the wrong time for cutting food stamps (even a modest cut). Or, perhaps you are a fiscal conservative who believes such a cut is essential for prudent government. Or, maybe you favor these cuts because you feel that legal immigrants do not deserve protection from hunger. Or, perhaps you want Congress to implement these cuts in order to have more money left to finance a tax cut for yourself. Don't let me tell you WHAT to think or what to say. Do let me tell you that NOW is the time to think it and say it. Congress expects to finalize the current reconciliation bill before the holiday recess. The Coalition on Human Needs provides a menu of actions to take, including a free telephone line to Congress this week only, if you want your view to be heard. The Government Accountability Office (GAO) this week recommended (.pdf) that USDA "improve the transparency of its market news reports [for the beef and pork industries], and its auditing of packers' transactions." Consumers and farmers both lose when meat packers can behave oligopolistically and anti-competitively. Frequently, in a particular market for beef or pork, there will be many farmers and many consumers, but only a small number of packers in the middle. Through a variety of anti-competitive practices, these intermediate players can pay the farmers a low price, charge the consumers a high price, and maintain higher profits for themselves. Sometimes, the farmers trade with a particular packer because they do not have the information they need about the prices that alternative packers are offering. One of the best remedies, without heavy-handed government intervention, is simply to ensure that the farmers have complete and timely information about the prices that diverse packers are offering. With such information, farmers can make the packers compete against each other for the farmers' product. There is a federal law requiring packers to provide price information, but GAO this week found fault with the resulting USDA reports. GAO also pointed out that USDA responsibilities in this area are fragmented between two USDA agencies, which do not always work together successfully to ensure competitive markets. MIAMI – Alarmed by the high rate of obesity among Hispanics, the U.S. Department of Agriculture released a Spanish translation Wednesday of the food pyramid, the government's handy guide to good nutrition. "MiPiramide: Pasos Hacia Una Mejor Salud" is the counterpart to the USDA's "MyPyramid: Steps to a Healthier You." Among other things, "grains" have become "granos," and "meat and beans" are "carnes y frijoles" on the diagram of the major food groups. The nation's Hispanic population is booming, and almost three out of every four Hispanic adults in the U.S. are overweight, according to a 2002 report in the Journal of the American Medical Association. Two out of three U.S. adults overall are overweight. "Obesity has reached epidemic proportions in the United States, especially in children and adolescents. Those statistics are even more alarming among Latin populations," Roberto Salazar, administrator for the USDA's food and nutrition service, said in Spanish at a news conference. The Global Development and Environment Institute (GDAE) at Tufts University this month released a new report by Timothy Wise, Identifying the Real Winners from U.S. Agricultural Policies. Who are the real winners from U.S. agricultural policies? It may not be the farmers who receive the billions of dollars in annual farm subsidies. There is little evidence that farmers as a group are reaping significant gains from current U.S. agricultural subsidy programs, even though they are the direct recipients. Low prices and high costs have left farmers with stagnant or declining net farm incomes. Furthermore, there is little conclusive evidence that the removal of U.S. subsidy payments would significantly reduce production or raise prices, though there is significant disagreement on this point. There is wider agreement that U.S. farm policies contribute significantly to depressed prices for agricultural commodities. Among the beneficiaries of those low prices are the consumers of U.S. grains and oilseeds, among them the concentrated animal feeding operations that now dominate the U.S. livestock industry. These industrial operations get feed that is generally sold at below farmers’ costs of production. The "Best Food Weblog" award program at Accidental Hedonist has several categories. For example, one category will honor weblogs that cover the food industry. Barbara from Tigers and Strawberries and Jack from Fork & Bottle both nominated U.S. Food Policy in this category. Elise nominated Life Begins @ 30, which tackled local food issues with an engaging campaign last summer. I don't know if Accidental Hedonist and Calorie Lab are excluded from eligibility, due to their role in hosting the awards, but these are both important relevant weblogs. I also like Fast Food Facts. Tom Philpott's Bitter Greens Journal would be a good choice, but it has been dormant, as Philpott has an even more interesting gig writing for Grist. Congress should enact legislation mandating a shift in the emphasis of advertising for children, away from high-calorie low-nutrient food and beverages and toward more healthful alternatives, the Institute of Medicine advised today. In its new report, entitled Food Marketing to Children and Youth: Threat or Opportunity, the highly esteemed panel of the National Academies recommended this unprecedented Congressional action, unless the same change in advertising emphasis is accomplished voluntarily without legislation. If voluntary efforts related to advertising during children's television programming are unsuccessful in shifting the emphasis away from high-calorie and low-nutrient foods and beverages to the advertising of healthful food and beverages, Congress should enact legislation mandating the shift on both broadcast and cable television. This striking recommendation is rather buried in the new report, and it stands somewhat in contrast to the mild tone and emphasis on public-private partnership in much of the report. The document is available for free online. The International Journal of Obesity published a sharply-worded letter from the editor in November, reminding Dr. Michael Zemel that the journal requires its authors to report any conflicts of interest. The Editor confirmed Dr Zemel's patents and patent applications and requested of him that in any future submissions to IJO, their presence be noted. Dr. Zemel is the author of a diet book, The Calcium Key, and holder of a patent on dairy weight loss claims, along with several additional related patent applications. In a letter to the Journal, DS Kalman had written to observe that recent research in the same journal had not corroborated some of the dairy weight loss claims, and to question the non-disclosure of Zemel's patents. Finally, it is disheartening that Dr Zemel did not reveal in this paper that he has one United States Patent granted for calcium as a weight loss agent (see 'Materials and methods for the treatment of obesity') and eight more pending United States Patent Applications. All of these patents and patent pending 'inventions' are for calcium as a weight loss/fat loss aid either through food or dietary supplements in addition to a plan for how to promote calcium consumption for weight loss. While obtaining patents or applying for patents is not wrong, the lack of disclosure of the possible conflict of interest should be reported to the readers. Given the concerns expressed above, it may be premature to accept the theory of calcium as a weight modifier. Zemel's patent is quite bold. It claims intellectual property rights on a method for achieving weight loss by -- hold your breath for the novel technology -- administering milk. The subject invention provides methods of inducing the loss of adipose tissue by providing a diet high in calcium. In one aspect of the invention, the calcium is provided in the form of dairy products. In yet another aspect of the invention, calcium is provided in the form of a dietary supplement, such as calcium carbonate, of vitamin supplements. The Dietary Guidelines Advisory Committee, commissioned by the federal government to assess the current state of scientific evidence on nutrition issues for purposes of dietary guidance policy, considered and declined to endorse the dairy weight loss message. Yet, the federal government's checkoff advertising campaigns rely on these weight loss claims as a central marketing theme. Legislation passed by the U.S. House of Representatives on November 18 would cut $700 million from the Food Stamp Program over five years, the Center on Budget and Policy Priorities reported today based on analysis conducted by the Congressional Budget Office. If corresponding language is accepted by the Senate and signed by the President, it will cut off about 255,000 otherwise-eligible people from participation in the nation's largest anti-hunger program. Some of my happiest musical moments in the past decade have been listening to, of all things, the upstate New York Reggae band, John Brown's Body. My concert-going time was limited for a couple years until child #2 turned three years old this summer, but now we have been having a lot of fun again introducing the kids to our favorite music. We took the family to the Grassroots Festival of Music and Dance in Trumansburg in July, where John Brown's' Body played delightful headline sets on their own and with the Meditations. We will go again this coming year. The homespun soldier's song that inspired the Battle Hymn of the Republic, the original "John Brown's Body" is on the playlist at my untalented but enjoyable nightly bedtime singing sessions with my kids. You might think that's morbid, but consider the competition -- all of the more typical children's songs on the playlist are also about death anyway. Rock-a-bye Baby, Swing Low Sweet Chariot, Freight Train, the Fox Went Out on a Chilly Night, Cockles and Mussels, and dozens more. The title, "John Brown's Body," makes a witty name for an upstate New York Reggae band, given the abolitionist's political message, the song's history, and the fact that Brown's corpse actually is buried in upstate New York. Why write about this in U.S. Food Policy? I occasionally write about related music and songs, and hope to do more. Today's occasion was simply that my foot was tapping as I worked to the song "Bread" from the band's latest album, Pressure Points: "Oh, the people they must all eat bread!" The 2006 National Anti-Hunger Policy Conference of the Food Research and Action Center (FRAC) will take place February 26-28, 2006 at the Washington Court Hotel in Washington, DC.